The fifth meeting of the season, made up of nine races all for trotters, was held yesterday afternoon at the Marsa Racetrack. This programme heralded the start of the first competition of the year, the Assikura Championship for Gold Class trotters with six heats on a short distance of 2,140 metres. The card also included a Premier Class race. It was won by French newcomer Robinson Wic. As expected, favourite Briga-doon (Rodney Gatt) set the early pace with Robinson Wic (Clint Vassallo) and Ranch Get On (Julian Farrugia) close behind. With a lap to go Brigadoon was still going strong. However, the Swedish trotter suddenly ran out of steam and started to falter midway through the final straight. Robinson Wic seized the initiative to win the race ahead of Briga-doon, P.A. Surprise (Lorraine Cunningham) and Retz Du Lys (Charlton Gauci) in that order. Robinson Wic clocked an average time of 1.15.9” per kilometre. Meanwhile, 24 horses qualified for the semi-finals at the end of the Gold Class heats. In the first qualifier, Swedish newcomer Energitj (Carl Caruana) secure its first win easily by a length from Palazio Valterne (David Ellul) as Quefi Des Caillons (Michael Ellul) went on to gain its first win of the season in the second Gold Class race. Noel Baldacchino put Swedish newcomer Power To Be in front with a lap to go in the next championship heat. 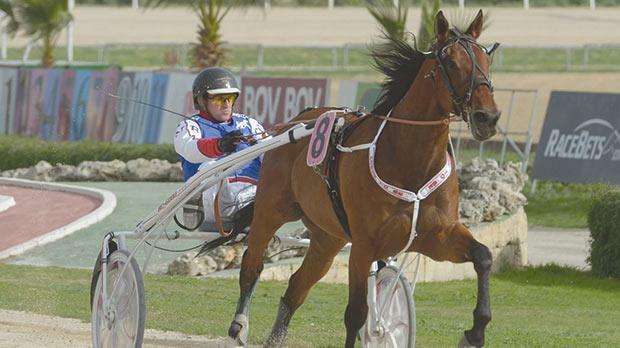 The nine-year-old trotter sealed its first win at the racetrack from Midnight Hall (Mario Fenech). Italian Lover Roc (Jesmond Attard) won the fourth heat as the most consistent horse of last year, Royal In, went unchallenged during the last 1,000 metres in the next heat. This Swedish trotter was driven by Marco Debono. Matrix Revolution (Noel Baldacchino) also cruised to its first win here in the sixth and final heat of the Gold Class championship after nosing ahead midway through the final straight.